2. Completely craving these 20-minute ancho chicken tacos. Want want want. 3. Okay, in the newest Nordstrom catalog I cannot get over the models wearing high heeled strappy sandals… WITH SOCKS. Is this seriously going to be a thing? I mean I can’t get into this. I have no sense of style but this isn’t like mini backpacks of neon jeans. This is crew socks with stiletto sandals. Are you doing it? 4. I’m in the middle of a meat obsession. Yeah, yeah. I know. But all I want to eat is chicken and pork and steak. Carnitas for dinner tonight! That’s what that means. 5. If you’ve been reading for awhile, you know that Eddie and I have little sleep wars, i.e. he sleeps like a toddler and steals the covers and does crazy things at night and doesn’t remember. Now that I’m awake a time or two in the middle of the night, I can take pictures and videos of said crazy things. It’s awesome and excellent for your marriage. Trust me. 6. I am so whacked out in the early mornings that this morning? I saw “Pittsburgh – Sprinkles” scrolling on the bottom of the news and I was like WHAT? What do sprinkles have to do with Pittsburgh? Is there a new store selling only sprinkles? Um no. They meant RAIN. I wish I was making this up. 7. I could not take The Walking Dead this week. At ALL. No no no. I don’t even want to see these last two episodes, I’m fearful. Are you excited for Game of Thrones to start? I’m ready for GIRLS to be over and maybe in the off season Andrew Rannells can come be my best friend. I think Eddie wants to know if you’re watching Better Call Saul. I’m not, but he loves it. Oh oh oh want to know what the highlight of my TV week currently is? From 6-10AM on Sunday mornings they’ve been replaying every season of Mad Men. Eeeek. 8. Have you watched Unbreakable Kimmy Schmidt on Netflix yet? I watched most of it and I can’t put my finger on it… but I love Ellie Kemper and the song NEVER LEAVES MY BRAIN. I find myself dancing around all day singing UnnnnnBREAKable! 9. Who is your 90s fictional heartthrob soulmate? This is the 2015 version of celebrity MASH. I got Zack Morris. Which is, like, 874% true. 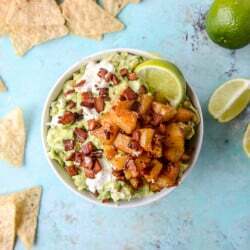 Caramelized Pineapple, Bacon and Goat Cheese Guacamole. I heard Unbreakable Kimmy Schmidt is amazingly hilarious. I need to get on this.